Sew what's cooking with Joan! 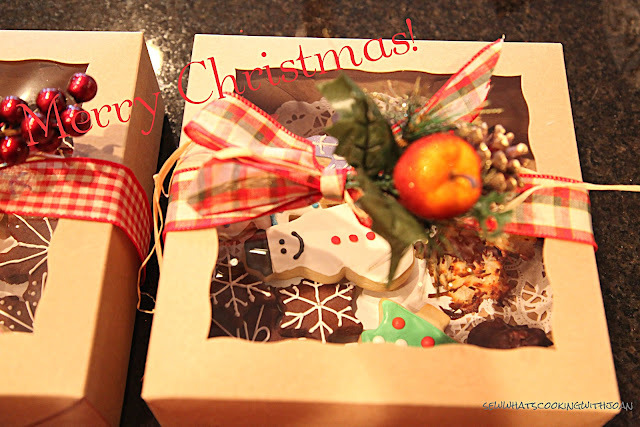 : Christmas Cookies -Part Two! Well, my two-week long cookie making extravaganza has come to an end and I have to say that I am pretty happy with how they all turned out. Time consuming yes! 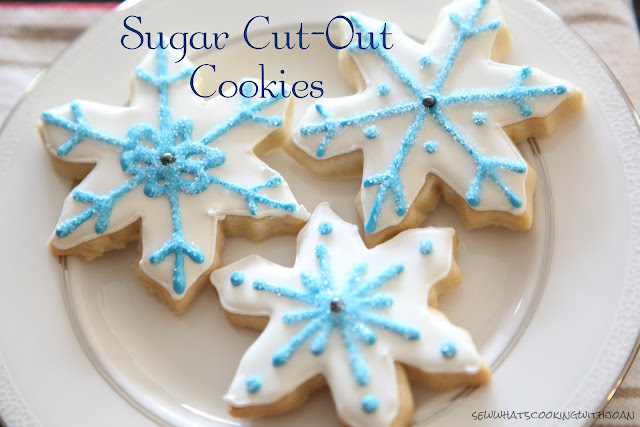 So much fun to make and I can't wait for the next excuse to make sugar cut-out cookies again!! I have a champagne bottle cookie cutter and I'm thinking New Year's!! I took a lot of photos so enjoy them and I hope they inspire you to make some cut-outs of your own! I have also included some links to video tutorials that really helped me create designs, etc. 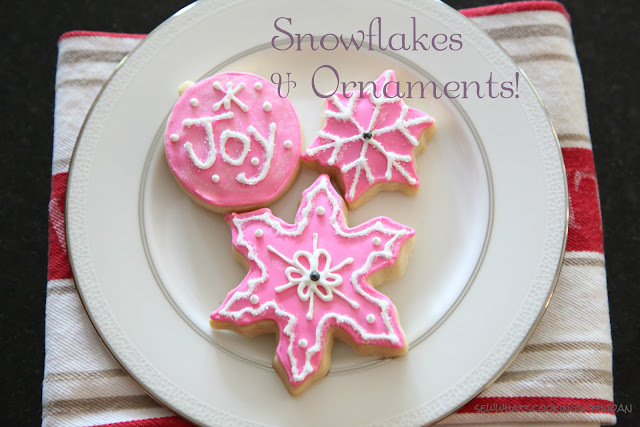 I am including the basic recipe for Royal Icing which I used on all these cookies. Royal Icing Recipe (using Meringue Powder) -courtesy of the book "Cookie Craft"
1-2 teaspoon clear vanilla extract (if you use the brown colored extract, your ising won't have that crisp white color look you are achieving). Clear colored vanilla can be found in craft stores or you can purchase online. 2. Beat on high for 5 minutes if you're using an electric mixer or for 10 minutes if you're using an electric hand mixer. If your mixer has multiple attachements, use the paddle. 3. When you reach the desired consistency, it's important that you immediately cover the mixture or store it in an airtight container. The consistency you are looking for is firm stiff peaks. 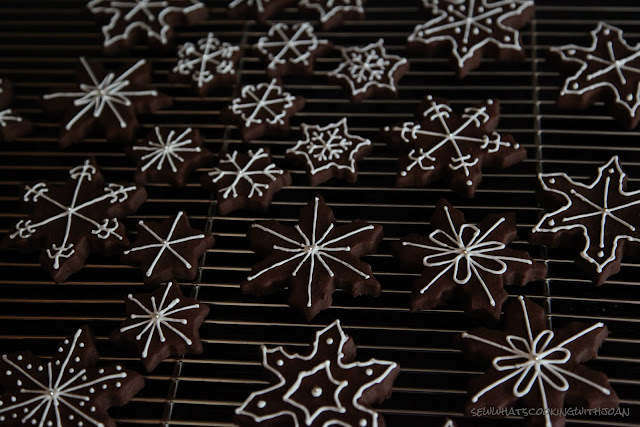 I made a rolled chocolate cookie and used plain white royal icing to decorate these snowflake cookies. 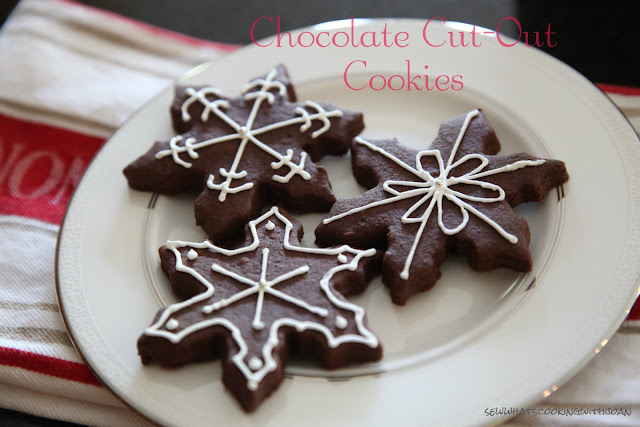 You can find many rolled chocolate cookie recipes online by doing a basic Google search. I bought some of my sanding sugars at Michael's Arts and Crafts and I also visited a local cake decorating shop here in Seattle. I think next time though, I will purchase online as you can often find things cheaper! Play around with the designs. You can use the same designs for both the chocolate and the basic sugar cookie. 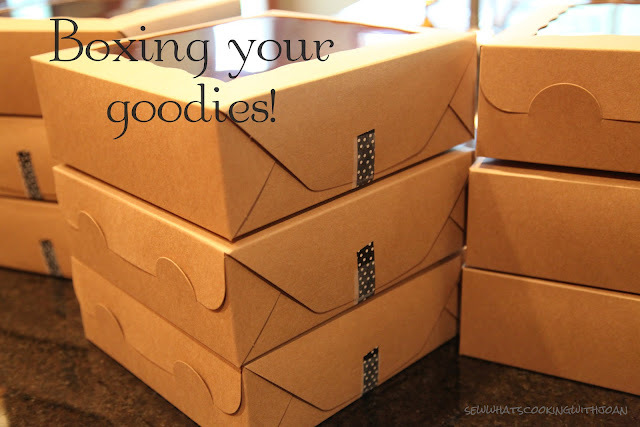 Here are some ideas on how to box your goodies! I bought my boxes online from a boxing company that specializes in food grade boxes. I then bought the decorative picks and holiday ribbon from Michael's. Hope everyone is enjoying the holiday season. I am off to deliver these goodies to our friends & neighbors! First off.....amazing! 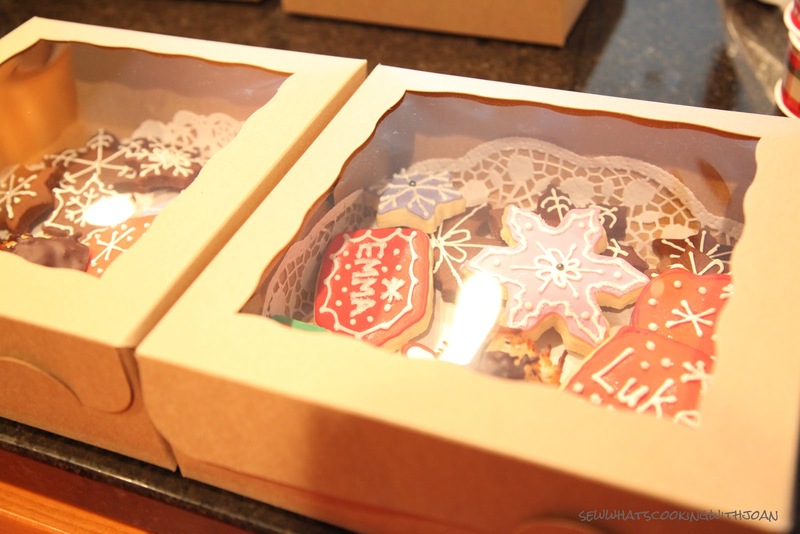 I never have seen such beautifully decorated cookies, they are ART PIECES!! Amy thank you, thank you, thank you for making such a detailed and time consuming post. 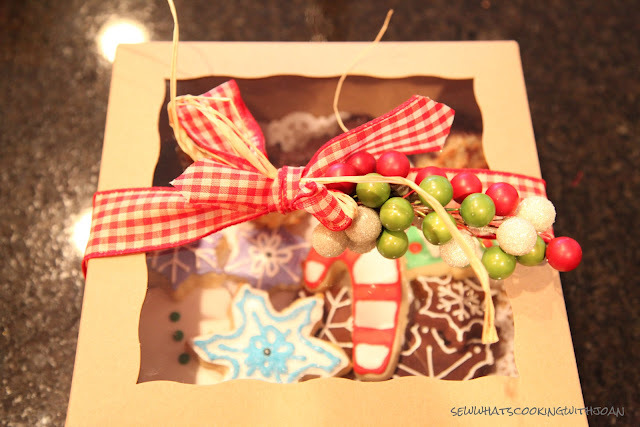 I will help with the New Years cookies:-) Also, I noted another use for our clear vanilla! I can't wait to get my box of cookies, I may not tell Wee Bear, and eat them all:-))Love the name tag with little Emma's name! You are amazing great post! Thanks mom! Your comment puts a BIG smile on my face! I would love the help in making New Year's cookies, sounds like another fun project! 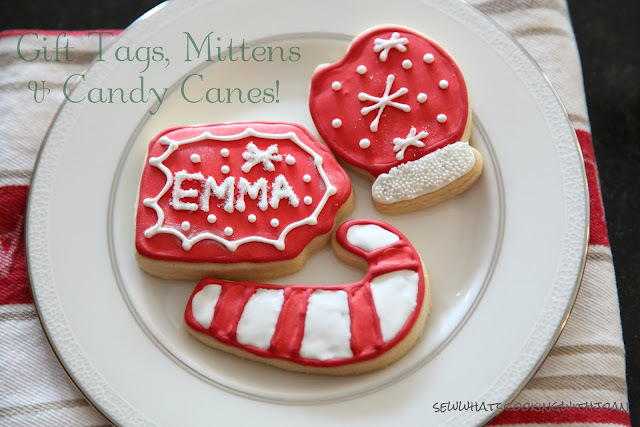 It was loads of fun making these and it got easier with each cookie made. 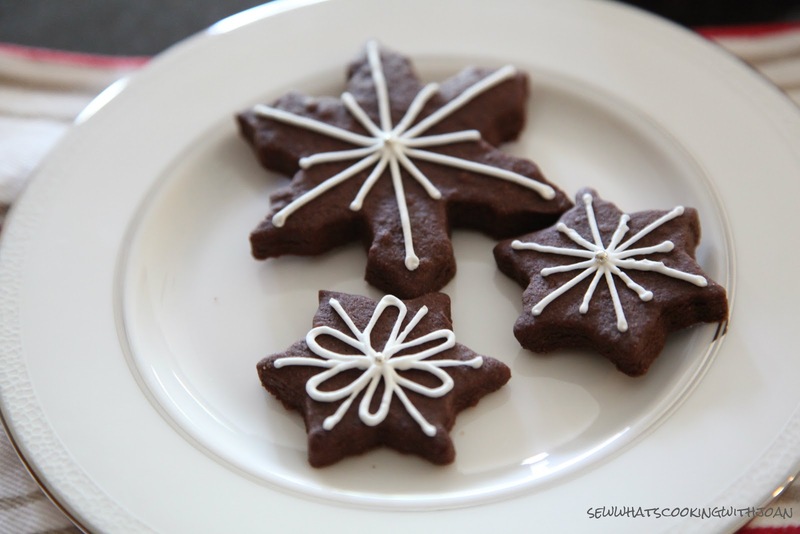 Looking forward to making and blogging many more cookies in the New Year! Okay fun! and right after we make them we will hike Mt. Si!! :-)) Fueled on sugar!! Maybe we can offer them to the establishment that we are partying at on New Years and charge $$ a cookie! Hahaha! Nothing but fun ahead!Smiling already! WOW! Your sugar cookies are so beautiful, almost to pretty to eat! Love your talented family. Thanks for inspiring all of us. Gorgeous cookies, Amy. I am very impressed! Priscilla -I wish we were neighbors too! Believe me, your house would be the first delivery! !